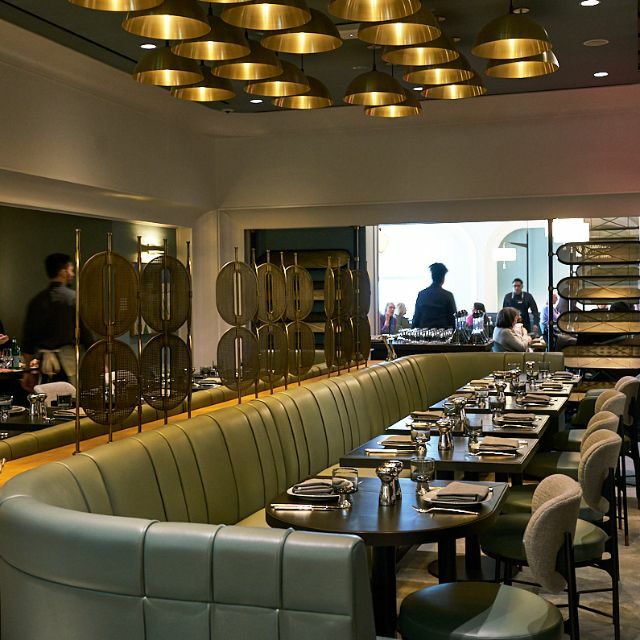 You must make reservations at least 5 minutes in advance of the time at The Zodiac Room at Neiman Marcus - Hudson Yards. **Afternoon Tea begins Monday April 15. 3-5pm. Be sure to denote this in the notes of your reservation if joining us for tea. With over 60 years of fine dining history at Neiman Marcus Restaurants we will serve customer favorites from our 45 restaurants nationwide. Each lunch will begin with a small demitasse of chicken broth followed by popovers delivered from the “popover cart” with strawberry butter. Our menu will include everything from composed salads, fresh seafood, house made pastas, vegetarian, vegan and gluten free menu items. Our beverage menu items include an excellent selection of specialty cocktails, wines, beers and non-alcoholic drinks. The Zodiac Room proudly features Irving Farm Coffee along with housemade desserts throughout the day. Afternoon Tea will be served Monday – Friday 3pm – 5pm. A la carte popover and consommé — $15. 30 grams, served with fingerling potato chips and crème frâiche. Green apple, watermelon radish, grapefruit coriander vinaigrette. Char-grilled chicories, arugula, orange, hazelnuts. Fennel, broad bean, zucchini, preserved lemon aïoli. Walnut, pistachio, apricot mostarda, cornichon. Kale, brussels, cauliflower, beets, zucchini, avocado, apricots, sunflower seeds, ginger-miso dressing. Labneh tzatziki, radish, heirloom tomato, feta, black olive crumb. Always a hot bowl of soup and a seasonal salad that changes daily. Neiman marcus chicken salad, seasonal berry tartine. Black quinoa, fennel, watermelon radish, arugula, caper brown butter. Thick cut bacon, smashed avocado, tomatoes, butter lettuce, kennebec fries. House made egg pasta, mixed mushrooms, asparagus, parmigiano reggiano. Asparagus, sugar snap peas, potato, caviar. Vermont white cheddar, balsamic onion jam, beefsteak tomato, arugula, kennebec fries. Fromage blanc, gruyère, lacinato kale, served with a little gem and agrodolce glazed bacon salad. Frisée, haricot vert, fennel, new potatoes, poached egg, sparkling vinaigrette. *these items are cooked to order. Consuming raw or undercooked meats, poultry, seafood, shellfish, or eggs may increase your risk of food-borne illnesses. Unlike Dallas location, didn’t disclose charge of $15/person for popover and broth. Ambiance was great and food was pretty good, but non disclosure tempered the experience. The room itself is surprisingly lovely because it has big windows, which are not immediately apparent. The view west is particularly stunning. The menu is varied but expensive. The food is first class. The service was excellent—friendly and efficient. The only thing I might want at Neiman is a sit down, service restaurant that serves inexpensive salads and sandwiches. This is after all, “just” a department store lunch. But for what it is currently, it’s delicious. We were guided to the dining area in the rear, where large windows frame the eastern view from the 7th floor, allowing expansive light and visuals of buildings nearby. 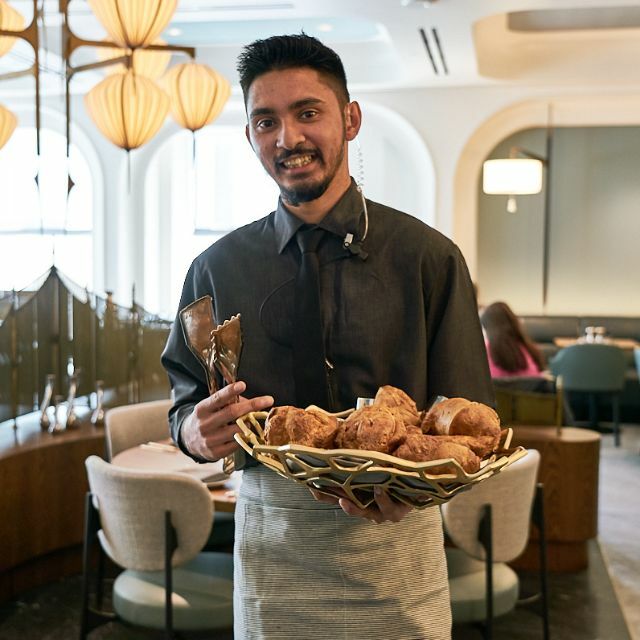 The Neiman tradition of complementary broth and popovers continues, which is a nice welcome to the quiet setting after jostling with crowds visiting Hudson Yards. We shared a raw vegetable salad, more than enough for two, and then enjoyed a delicious lobster sandwich and lamb burger. Along with sparking water and two glasses of wine, our bill totaled +$140. The value is in the entire package: calm atmosphere where you can actually have a conversation, excellent service, menu of luncheon-type options and bar items available. Fabulous experience! Eva our server was wonderful. Loved dining at Nieman Marcus. Popover and broth service always a great way to start a meal - a terrific tradition. Loved the view. Afternoon tea was a treat! 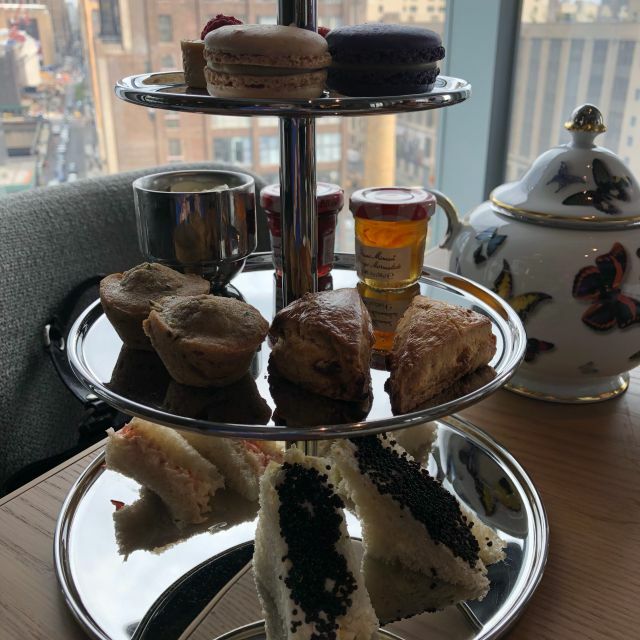 Had the afternoon tea. We’ve had afternoon tea at many places including Europe. The food was the most delicious we’ve ever had. Our waitress Ro was amazing. Had a great corner table with a view of the Statue of Liberty. It was my husband’s birthday. I asked to be seated at a nicer or at least more private table and we were not accommodated. When my $35 a glass of champagne was poured there was almost no champagne left in the bottle so I was served less than a half a glass. I waited patiently for the server to return with more and he forgot about me. We ordered two desserts and there was no fanfare or even a candle. It was hard to find something healthy to eat because the menu has mostly dishes made with butter or cream. Very old school selections considering how the food industry has evolved. This restaurant has a long way to go. Big disappointment, but we still love the Zodiac room in Dallas. My guest liked the mushroom-pasta special. The ambiance is a bit drab. Marcus. Waited until 3 for the first seating. Tea service doesn’t start until following week. The waiter was great. When my mom asked for a lobster club sandwich to be presented as a salad the waiter facilitated the switch with no hassle. The accommodating waiter made our dining experience more pleasant. The service is essentially non existent here. We waited about 10 minutes to get water. Waitress arrives later to take our orders without introducing herself or telling us about the specials. Then I ordered the duck confit, which is listed as an entree in the menu for $34. Instead of a duck confit, I got a duck salad. I did not order a $34 salad! The waitress was nowhere to be found until it was time to collect our plates. She did not ask how the food was and simply gave us the check. Unquestionably, I will NEVER dine at another Neiman Marcus restaurant again and highly discourage anyone from doing so. Great food and service. Upscale restaurant/bar in a shopping mall is rare to find so great way to end a day at hudson yards. We were very excited for our experience but it was mediocre at best. The popovers and butter were the highlight but the service was VERY SLOW. We were seating in a corner away from the view even though there were open tables near the view and we were denied when we asked to move. The chicken broth came to the table with no explanation of what it was. Overall less than satisfactory. Zodiac is an absolute delight. Venue is lovely with floor to ceiling windows and soaring ceilings. Chic & Contemporary... comfort all around. Staff are wonderful. Friendly and accommodating and always with a smile. The menu is NM Perfection. Especially love The Mandarin Orange Soufflé... a must! From the Almond Chicken Salad to the Berry Tartine, this dish is a TREAT! The Hudson Salad is our fav.... filled with kale, beets, Brussels, zucchini to name a few ingredients... the miso dressing completes this dish. Just love it! The menu is chock full of wonderful items. From Caviar to Gelato... there is something for every taste bud. We were surprised that this restaurant had it together for just opening two weeks or so ago. No sign of "birth pains". Reception was very welcoming. Service was very good. The staff looked like they enjoyed their job. Popovers were served as expected with the delicious spread. Quiche dish was the best according to my daughter. My "pot luck" dish was very generous which included Scottish salmon trout with salad plus the tomato basil soup of the day. The chicken salad with souffle dish was very tasty and intersting. Cortada coffee was perfect. We wanted to try the aftenoon high tea after our lunch but they were not serving it as yet. So we must go back when they offer it. Missed the complimentary chocolate mint or is it at Bergdorf's? We loved shopping too and then had a drink at the wonderful Stanley Bar on the 5th floor. Glad to see Neiman Marcus in Manhattan. Service was 100%. And atmosphere was so beautiful. If you haven’t been...book a table! I eat at the Neiman Cafe in Garden CIty /Roosevelt field often. I think Hudson Yard restaurant needs to expand their menu. They are trying to be too fancy for the space. The salads only had feta cheese, not enough choices, It was good but will go elsewhere. Please expand your menu. Lamb burgers??? really- don't try to be too trendy for lunch. Only open a week - exceptional waitstaff. Runners, bussers need training. Kitchen needs help. Food good, plate presentation poor. Lobster Club should have 2 layers, and more than 1slice of bacon, buttery grilled bread was nice touch. Change chicken consommé amuse to something/anything else ASAP. Great service and food. Value is relative to location. Hudson Yards is now an upscale destination with the best mall in the region with the best stores in the US. The restaurant is in Neiman Marcus. Drinks and food ( lamb burgers, salmon salad with martinis) were excellent and if the newness wears off a little you will find options for a reservation. Right now, take what you can get. Oh, the chicken broth and popovers(gratis) were a meal all to themselves! Wonderful lunch..food excellent... service perfect...room beautiful..can not wait to return for tea and Sunday brunch. Neiman Marcus is the perfect anchor of Hudson Yards! What an incredible store. 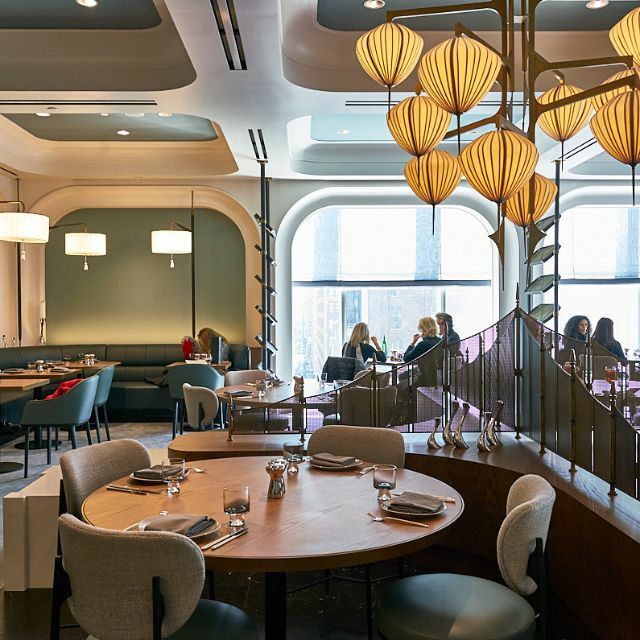 The Zodiac Room is the grand slam living room of dining at The Shops of Hudson Yards. Exceptional service. Great view from the main area. Bar area within The Zodiac Room equally bustles with chic locals and tourists. Lobster roll is like dessert. Congratulations!